Here's the Munchkin Progression Board: a dungeon room for each level, and slots for card packs and discards, so you know at first glance who's beating who's in the lead. Contains male / female pawns in six colors and matching bonus pawns with special game benefits for each player. You will have even more reason to tear you away from trading cards! And in addition, you will have four Munchkin cards completely new! Be careful this game is an extension of Munchkin ... + 1 more+ 1 more and cannot be played alone. 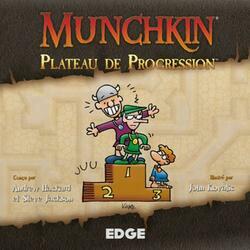 To be able to play it you must have a copy of the game Munchkin ... + 1 more+ 1 more.